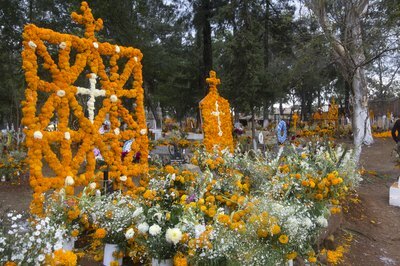 The Day of the Dead (Día de los Muertos) celebration takes place annually on the first and second days of November. On these dates, residents of Mexico and Central America celebrate deceased loved ones' spirits as they return to the land. While it might sound morbid, this is in fact a happy celebration for participants. The lives of the dead are celebrated, and the belief is that the living will eat, dance and drink with dead relatives. The tradition, which dates back to before the 8th century, is laden with symbolism -- including the meanings of the colors used in the decorations. The color of black represents death in Day of the Dead tradition. Black symbolizes the land of the dead and the pre-Hispanic religions of the people. 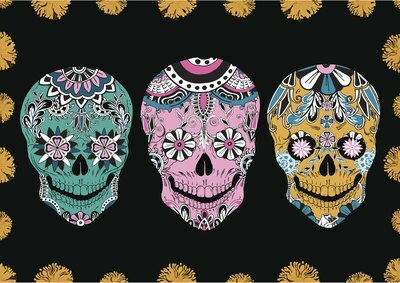 Black is not used as much as the other Day of the Dead colors and is often seen as a background color in Day of the Dead artwork. Purple is a very important Day of the Dead color. Purple candles are lit at the altars in people's homes. The color purple in the celebration refers back to the Catholic calendar. It signifies pain, suffering, grief and mourning. The families of the dead use purple to acknowledge their loss of loved ones. Pink is symbolic of celebration in the Day of the Dead celebration when people are paying joyous tribute to the lives of the deceased. They celebrate the return of the dead and their reunion with family members. 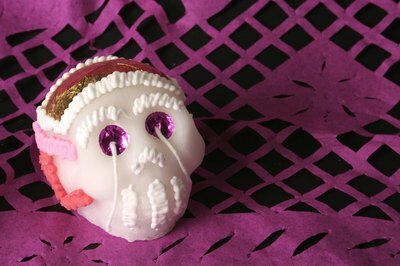 Often Day of the Dead skeletons, or calaveras, are painted with the color and wear pink dresses and suits. Day of the Dead revelers use white to signify purity and renewal, as if the souls of the dead have been wiped clean. White also represents hope and is present in flowers at the altar, along with the traditional paper decorations. Marigolds are widely used to celebrate the Day of the Dead. The petals of marigolds are sprinkled on the ground leading up to the altar, so the dead use can use them as a guide. Marigolds come in orange and yellow, making these colors very important. Orange also represents the sun and yellow symbolizes the light and also death. Red signifies blood or the blood of life. For Christians red is for the spilled blood of Jesus Christ. For the non-Christian Day of the Dead celebrants, red often stands for the blood of people or animals. 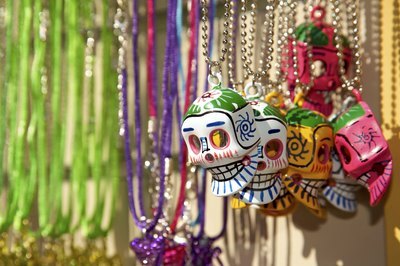 What Countries Celebrate Day of the Dead?